Preheat the oven to 220°C/Fan 200°C/Gas 7. Trim any visible fat off the bacon rashers and cut them into strips about 1.5cm wide. Mist a large non-stick saucepan with oil and place it over a medium heat. Add the bacon to the pan, then stir in the mushrooms and cook for 4 minutes, stirring regularly until they are beginning to brown. Add the leek and chicken and cook for 1 minute more, stirring. Sprinkle over the flour and cook for a few seconds before gradually adding the stock, just a little at a time. Bring to a simmer and season well with a pinch of salt and lots of freshly ground black pepper. Add the broccoli florets and peas and bring the water back to a simmer. Cook for 4 minutes, while stirring, until the sauce thickens, then remove from the heat and stir in the crème fraîche. Divide the mixture between 4 individual pie dishes – each will need to hold about 350ml. Spray each sheet of filo pastry with oil and cut them into 4 wide strips. Working quickly, top each dish with 3 strips of the filo, oiled-side up, crumpling and scrunching them loosely as you go. 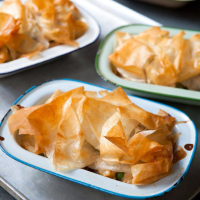 Place the dishes on a baking tray and bake the pies in the centre of the oven for 12–15 minutes or until the pastry is golden brown and the filling is hot and bubbling.